Oh sure, Rodney. ADHD? Seriously? Everyone’s claims that. People typically don’t believe me. We’ve all seen ADD (Attention Deficit Disorder) or ADHD (Attention Deficit Hyper-activity Disorder) kids. They literally bounce off the walls. They can’t sit still. They talk non-stop. They’re annoying. I’m not those things. Well, okay, maybe the annoying talk alot guy; I am a writer and storyteller, after all. When I went to talk to my doctor about ADD she was more than a little skeptical. I’m having a tough time believing these test scores. You are sitting here calmly in my office you aren’t fidgeting, or pacing or exhibiting any of the classic ADHD symptoms. I do public speaking. I have for years. I’ve done corporate training, Toastmasters, presentations. As a presenter, you have to train yourself to avoid “ticks.” Many people click their pens, or jiggle their keys. Speakers learn to recognize those traits and then eliminate them. It doesn’t mean I don’t want to fidget or talk incessently, or pace. It means that I’ve learned not to. But, there’s a another side to ADHD. My lovely wife gets frustrated when she needs me to focus, like on a serious conversation. The higher the tension, the more I have to do something. It bugs her if I look at my iPad. I’m not ignoring her. My brain is just going about 100x faster than the conversation and I need someplace to park those extra cycles. But, to her, it looks like I’m retreating. Instead, I fold socks. There’s often a pile of clean clothes, my clothes waiting to be folded and put away. I go to work on that pile. If the conversation lasts longer than the sock pile, I switch to cleaning my nightstand. ANYTHING to soak up those extra brain cycles and keep from going crazy. ADHD also allows something called hyper-focus. It’s hard to get started on a project, but once engaged, I can stay engaged for hours, often to the exclusion of everything else. That’s where music comes in. It masks other stimulus and helps me focus. It keeps me in the moment. I use it a lot when I’m writing. I have over 7,000 songs in my iTunes library. 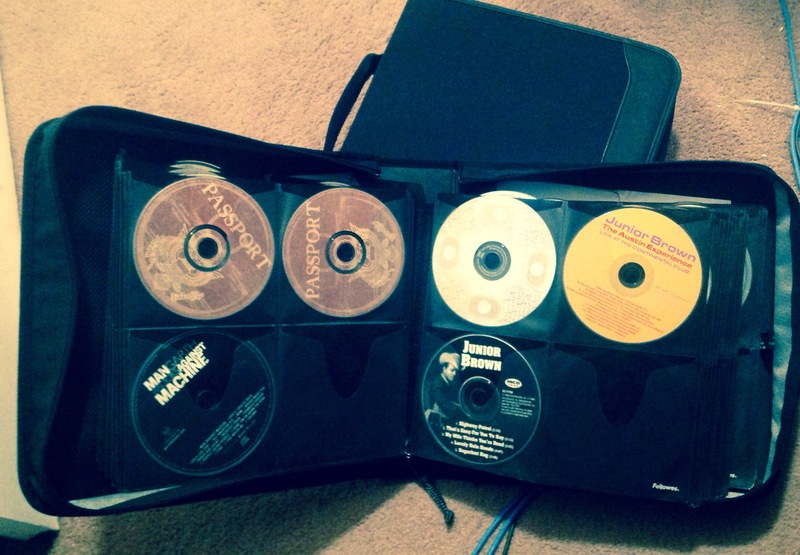 Most of them were ripped from CD’s. I still prefer CD’s. I put my playlist on random and I get a new and comfortable familiar group. Some songs are like old friends. Other’s I hear seldom. But, they aren’t distracting. Unfortunately, I don’t just have songs in iTunes. I have books on tape. But worse than that, I have about a dozen comedy albums. Some like Blue Collar Comedy Tour, are national headliners. Others are my friends’ CD’s. Music is a comforting background noise. Standup comedy is the worst for me. If I don’t hit NEXT soon enough, I get sucked in. Not only does it knock me out of the writing zone, I then start listening to Ron White tell the story about getting thrown out of a bar in New York City (I LOVE that story.) And I’m out for minutes, sometimes hours. I suppose I could create playlists, but who is going to build a playlist with Quiet Riot, Billy Joel, Imagine Dragon, Carrie Underwood and the Mormon Tabernacle Choir? What do you call THAT list? I was going to write more, but Jeff Foxworthy is explaining You Might Be A Redneck on iTunes and I love his story. Sounds just like me. I have about 750 GB on a portable drive across all genres, including comedy, but not a lot of books. I actually took some down time and created about 25 playlists. My favorites for coding/working are a couple that are mainly instrumental. One is classical, the other is movie soundtracks. Each is about 45 hours long so I can put them on shuffle and listen for a couple days without worrying about repeats. « But Can You Dance To It?